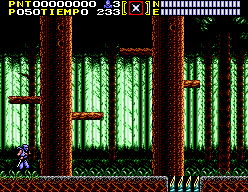 Ninja Gaiden for the Sega Master System is a very good good game and it is just as difficult as it’s Nintendo counterpart. If only the cutscenes weren’t stills and done the same way as they were on the NES then a lot more people would have heard about this version. It features a completely different story then the NES version, but it’s nowhere near as interesting. Here’s the gist; Ryu has come back home after killing some bad guys and finds that his home is in ruins, and his clan has been killed off. They took a scroll of immense power called the Bushido, and Ryu goes off to get it back. He must fight off ninjas, a Sumo Wrestler, and Samurais. The story then takes a twist and now you must also save a pretty geisha girl, and Ryu finds out that someone named Dark Shogun is behind it all. But don’t let the generic storyline fool you, the game is worth playing. 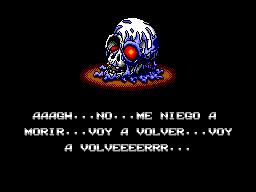 The soundtrack is OK, but the graphics surpass the NES version and features 8 stages with a variety of enemies. It features a wall jump and some different powers that aren’t in the NES version. 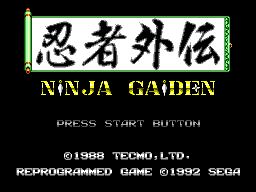 If you love the Ninja Gaiden series then you owe it to yourself to give this game a try. It is one of the best games that came out for the SMS. 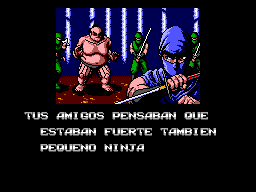 THis is the spanish translation of Ninja Gaiden for the Sega Master System. The credits(which there were not really much of anyway)were not translated and the pause graphic because the author didn’t feel like decompressing and recompressing graphics just to turn an E into an A. But everything else is done. If it says (proto) and it has a picture of a cartridge board next to the name when you load it up in Meka, then you have the wrong version.